To understand South Africa’s political repositioning in recent history, its racial tensions, social and economic divides and its ever evolving nature, you have to understand the country’s past. This is the mammoth task Dominic Lapierre has taken on with his epic historical account of the rainbow nation. Divided into four sections, ‘In Search of a New Promise land,’ ‘The Prime Minsters Bulldozers,’ Helen and Chris: Two Lights in the Darkness and ‘God Bless Africa,’ Lapieere chronicles a horrid and harrowing history of oppression and subjugation. By 1946, almost 300 years after the Dutch settlers arrived, ordinary South Africans had embarked on a fight that would cost lives and see their freedom taken away. The painful reality of apartheid was fully in motion; South Africa divided along racial lines which meant indigenous South Africans were foreigners in their own land. The prime minsters bulldozers moved in and razed down neighbourhoods where blacks and whites had lived side by side. One’s basic right to love as you so desired or live anywhere you wanted to, become illegal. Lapierre forces you to ask, when all you have has been taken, what do you have left when stripped of the most basic dignity? Nonetheless, Lapierre shows the other of the coin as the likes of Nelson Mandela and Walter Sissilou rise up and continue the fight their ancestors had been known for. It was the fight that would see them spend years in prison as a new generation of South Africans battled the startling reality of their restricted lives. By the 70s Jon Vorster and his government had successfully ensured over 20 per cent of South Africa’s 6 million black population, were living in cramped ghettos under their ethnic redistribution agenda, a deportation described by Lapierre as being of colossal magnitude. However, the likes of Helen Lieberman, who defiled the authorities and extended a hand of friendship to both black and whites, offering a thin ray of hope. Her simple actions were effective, so was that of those who took to demonstrations and external forces forced to question the racially divided South Africa. Becoming ever more isolated as apartheid collapsed on itself, a new era came when Nelson Mandela was release but this too came with its own challenges. Some of which continue to percolate to date. Lapierre’s story is one of pain and hope told with great sensitivity, though he could be accused of bias towards the ANC. 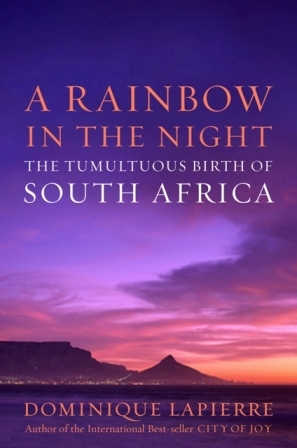 Nevertheless, A Rainbow In The Night: The Tumultuous Birth of South Africa, is an absorbing read which shows triumph over adversity as a future generation was rescued from the ills of apartheid, considered one of the greatest tragedies of the last century. In the same vain, Lapierre manages to question the reality of the rainbow nation promised after the historic 1994 elections, as he highlights the new challenges as they exist today. A must read for anyone passionate about African history and the many cycles its nations have grown through in order to define themselves. This entry was posted on Thursday, April 7th, 2011 at 4:31 am	and is filed under Africa, Book Reviews, Journalism, Politics. You can follow any responses to this entry through the RSS 2.0 feed. You can leave a response, or trackback from your own site.